You are here: Home / Our Animals / Chickens / DIY Projects / 13 Chicken Feeder Ideas: No-Waste, PVC, & More! If you’re raising backyard chickens, then you’ve likely also come across the pesky problem of raising mice and rats. A good quality feeder solves unwanted food freeloaders and keeps your feed fresh and bacteria free. In this article, you’ll find DIY chicken feeder ideas that’ll keep your coop a clean and happy place for your flock. Rats and mice are a problem because not only do they eat your chickens’ food, they leave droppings, attack young chicks, and spread disease. So, keeping them out and away from your flock is critical. Let’s go over what you need to know, and how you can make your own DIY no waste chicken feeder. (If you don’t want to make one, here’s the no waste chicken feeders I recommend. There’s links to different ones on Amazon and they’re all high quality and affordable). What Can I Make A Chicken Feeder Out Of? What Do You Feed Organic Chickens? Should I Hang My Chicken Feeder? How High Should I Hang My Chicken Feeder? How Do I Keep Rats Out Of My Chicken Feeder? Anything can be a chicken feeder as long as it can be removed from the coop for cleaning and it holds food. But if you’re here, you likely want something more sophisticated AND that’ll keep pests away from your chicken feed. A bowl is great, but it won’t keep mice and rats out during winter, when they’re more likely to try to build nests in the nooks and crannies of your coop. It’ll also attract ants, and give your flock a way to throw their feed everywhere – making clean up a nightmare. So, let’s look at different DIY chicken feeder ideas that you can try at home! The possibilities are really endless – this is just a brief list of possible materials. You might even have them on hand if you build your own chicken coop! We’ve found it easiest to make a no waste feeder from PVC, from parts sourced at any hardware store. Another easy option are the repurposed food-grade barrels. (See our DIY horse feeder tutorial here – it can easily be adapted for poultry). In my experience, these are the two simplest chicken feeder ideas to implement. While wood seems like a good idea, and it’s readily available, it’s not very easy to clean, and it can harbor bacteria in the grain. If you have access to welder (a simple one is around $100 at hardware stores), a metal chicken feeder is great also. Making a DIY chicken water feeder out of a 5 gallon bucket takes just minutes. This one is my favorite! While this video is about how to make an automatic chicken water feeder out of a 5 gallon bucket, this idea can very easily be adapted for feed. It costs about $12, and will take 5 minutes of your time. Easy access to feed and water will improve egg production and lower the chances of your chickens developing bad habits like feather picking (which can easily be confused with chicken mites, so make sure they’re truly bored). Wondering how to make a chicken feeder out of wood? This idea is good – but just note that it’s made out of wood. So, you’ll need to take extra care to clean it. If you have wood hanging around, though, it’s very easy to make! We recently built one of these for our chicken coop, and it’s an easy chicken feeder idea to execute. 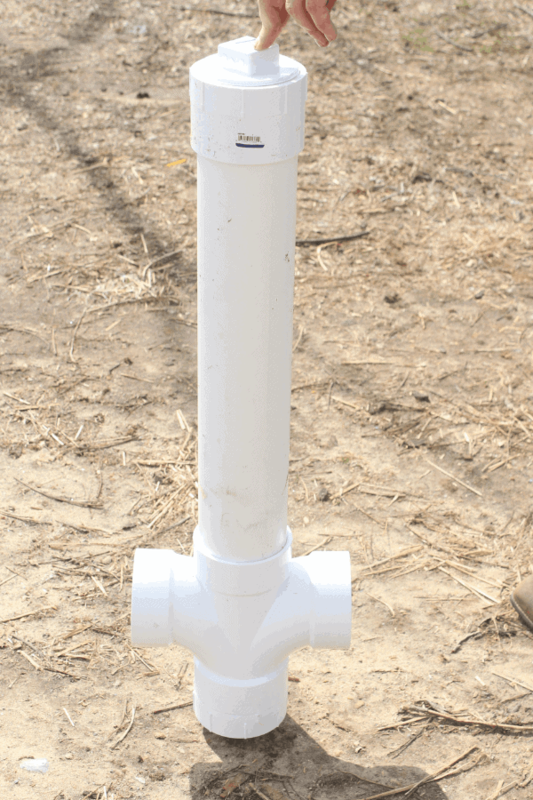 You’ll need to decide whether you want to drill holes into a PVC pipe for individual feeding holes, or remove the top portion of the pipe for easy group access. You’ll also need to make sure there’s enough holes for each chicken – so if you have a large flock, like I do, then making access as easy as possible will also make your life simpler. If you want to locate your feeder outside the coop, then you’ll need to make sure it keeps the grain dry. Sometimes chickens can be picky about the texture of their feed, and might turn their beaks up at mushy mash. Muddy feed also molds fast (and can shorten your backyard chickens’ lifespan) – so, it should always be a priority to ensure your chicken feeder keeps your flock’s food safe from the elements that could cause it to spoil. The easiest way to execute this chicken feeder idea is to add a rain hood or cap onto a PVC feeder. You can also try to make the PVC feeder below – this one has a rain hood you can find at any hardware store. The only caveat is that because of the rain hood, it can’t be closed – so rats can still get in. However, it IS a no waste feeder. You will need to make multiple ones, however, if you have a larger flock. If you have a plastic tote (aka Tupperware bin) hanging around, you can make an easy no waste feeder from it. You’ll need to drill holes into it (2-3 inch holes) and add PVC pipes. You can use glue to hold the PVC in place. It’s easy to clean, reduces food spoilage, and keeps your feed dry! DIY YouTube chicken feeders are easy to execute because you usually get step by step instructions. If you have a lot of time, and are handy, then this chicken feeder idea might be for you. Looking at the video, it feeds chickens a few grains at a time when they poke at a hanging element. It’ll also certainly keep rats out of your food. For more intelligent and mischief-loving breeds, like Speckled Sussex, a feeder like this will entertain them for hours. For chicken feeder ideas for your chicks, here are some incredibly creative and simple chicken feeder ideas for you to try. A high-quality layer feed with 16% protein and supplemented with nutrients is the best thing to feed backyard chickens. You can make your own feed using my layer feed recipe here, or find a high-quality non-GMO chicken feed here. You can also supplement their diet with table scraps, alternative chicken feeds like dried insects, and high quality chicken treats. It’s also critical to know what chickens can’t eat, like avocado and dried beans. You can also find a list of what chickens eat here. Yes, hang the chicken feeder to keep vermin out of it and so your chickens don’t poop in their grain. Be sure to at an appropriate height – 8 to 12 inches off the ground is best. You can also hang it about the middle of your bird’s back, if you think 12 inches is too high. In addition, by hanging your chicken feeders, you prevent vermin and predators from getting to the food. 8 to 12 inches off the ground is best. You can also hang it about the middle of your bird’s back, if you think 12 inches is too high. Remember that some chicken breeds like Silkies can’t fly, and Cochin bantams and Sebrights are very short, so make sure your feeder is at the right height for everyone to get a meal. To keep rats out of your feeder, you’ll need to use a feeder that closes. Also store food away, and make sure to clean up any spills as they are likely to attract unwanted guests. You can check out my automatic chicken feeder ideas here. 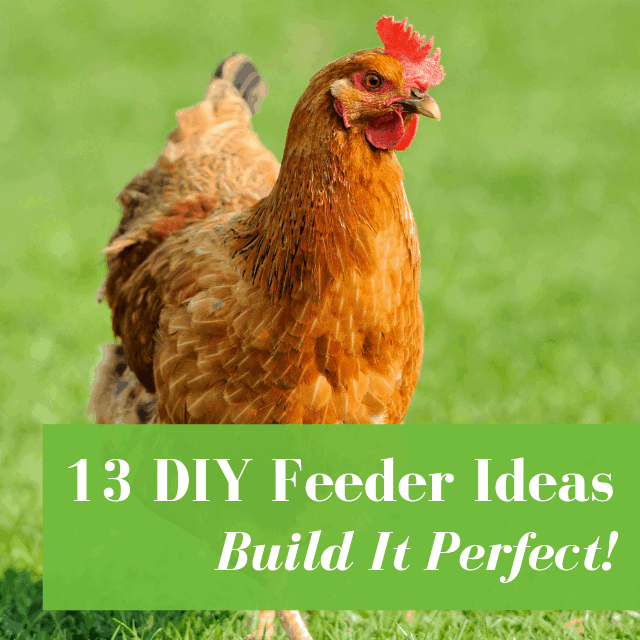 In this article, you’ll discover 13 easy DIY chicken feeder ideas that’ll keep your coop a clean and happy place for your backyard flock.